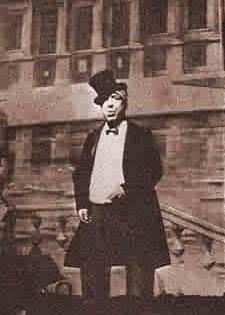 Harry Champion (real name William Crump) was born in Shoreditch in 1865 and first appeared in Music Hall at the age of 15. 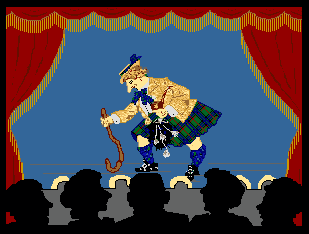 In 1888 he changed his stage name from Will Conray to Harry Champion and with a wide repertoire of songs, many of them sung at breakneck speed, he became one one of the Music Hall's most successful artists. Many of Harry Champion's songs are still well known today and include "Any Old Iron", "Boiled Beef and Carrots" and "I'm Henery the Eighth I am". and " A Little Bit of Cucumber" which was a favourite during the First World War. 'Enery the Eighth I am, I am. She's been married seven times before. She wouldn't 'ave a Willie or a Sam. 'Enery the Eighth I am! What few people realise however is that Harry Champion spent most of his life in Tottenham and in 1918 his address was given as 'Ascot Lodge' 520 West Green Road. He later moved to 161 Great Cambridge Road, Tottenham, this being his address at the time of his death in 1942. This is quite close to Lordship Recreation ground and no doubt he was resident at the time of the Downhills Shelter tragedy in Sept 1940. Harry Champion also seems to have run a cab/taxi business for most of his life. Even at the height of his fame he is reported as saying 'I have not made a fortune out of it. That story got about in the old days when I used to let broughams out on hire to my brother pros! I never went into the business for profit. I started it because I like to see a bit of the country myself and I went on with it to keep off the drink'. Many sources, not least of all Champion himself, confirm his long standing connection with the cab/taxi business, which seems to have continued well into the 1930's and possibly involved his relations. His son William Henry Crump, who acted as executor of his will in 1942, was described then as a 'Motor Engineer'. We now know that they established 'North London Coaches' in the 1930's but their fleet of vehicles was commandeered by the government at the outbreak of war in 1939. 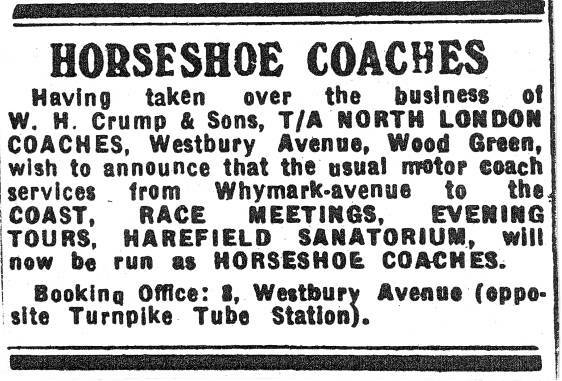 Surprisingly however it has emerged that 'North London Coaches' were acquired by Horseshoe Coaches in the early post-war years. We also understand that the former Horseshoe Coaches garage in Summerhill Road was often frequented by Harry Champion prior to the war. We have received an eye-witness account of a former Tottenham resident that he first learnt to drive in the Summerhill Road garage in a car owned by Harry Champion. It transpires that he was a childhood friend of Steve Crump, Harry Champion's grandson. The possible Horseshoe Coach connection is most intriguing. To add to the coincidence, Harry Champion was often referred to simply as 'H.C' and we know Horseshoe Coaches also used the same abbreviation as part of their livery. Clearly we have some more investigation to undertake to help clarify the situation.